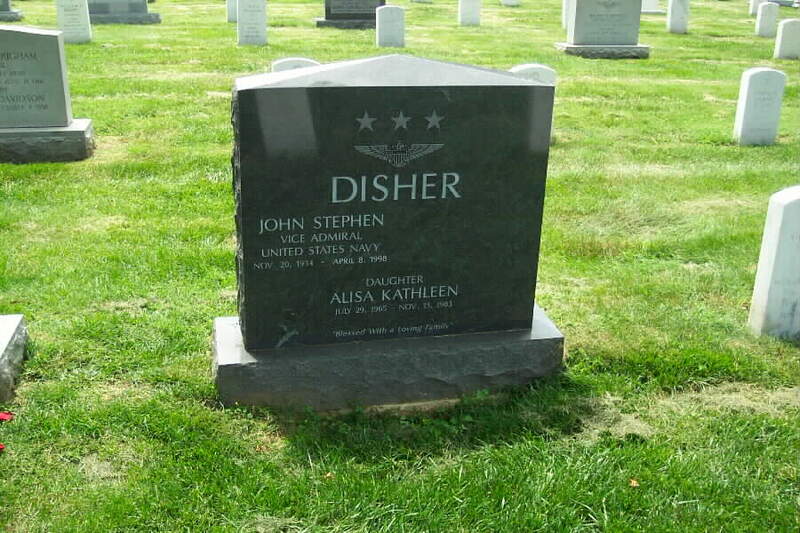 John Stephen Disher, 63, an aviator, Vietnam War veteran and retired Vice Admiral who was credited with improving safety while serving as the Navy's top training officer, died of cancer April 8, 1998 at his home in Pensacola, Florida. He flew more than 275 combat missions in Vietnam, and his decorations included the Legion of Merit with four Gold Stars, the Distinguished Flying Cross with a Gold Star and the Bronze Star. Admiral Disher, who became chief of naval education and training in 1988, presided over an extensive review of training safety after the death of a recruit who was repeatedly forced back into the water by instructors during training as a rescue swimmer. The recruit had a heart attack and drowned. He was buried with full military honors ar Arlington National Cemetery on 15 April 1998. VADM John Stephen Disher Section 11 No. 348-2 Full Honors, Minute Guns, Gun Salute Flyover with 4 F-14 Tomcats in Missing Man Formation 15 April 1998.